I noticed this little chicky as we stopped along Avenida Juscelino Kubischeck (oh, heck I can't spell it; I always just call it "Jota Kah" or "JK". It was right in front of a huge corporate tower and I thought to myself why? 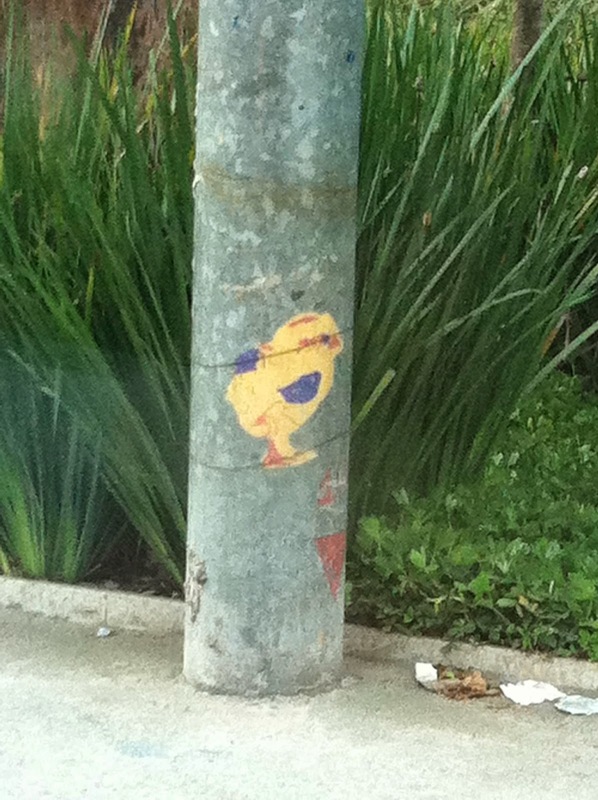 Of all the things or words one could graffiti on a telephone pole, why a cute little yellow chick with purple wings? I have no answer. Tomorrow morning we take off early for five days in Rio de Janeiro. For all you bad guys out there, I'll have you know that I have all security systems activated. Including the tripwire electric shocks (I had better warn my labradors who knowing them will probably like the zappies). I haven't spent any real time in Rio since getting married there in April 2002. Yes, BH and I celebrate 12 years of marriage on Sunday, along with yellow peep day known as Easter.